Alita: Battle Angel is a 2019 American cyberpunk action film based on the 1990s Japanese manga series Gunnm (also known as Battle Angel Alita) by Yukito Kishiro. Directed by Robert Rodriguez, the film is written by James Cameron and Laeta Kalogridis, and produced by Cameron and Jon Landau. Rosa Salazar stars as the titular Alita, a cyborg who sets out to learn about her past after she awakens in a new body with no memory of who she is. Christoph Waltz, Jennifer Connelly, Mahershala Ali, Ed Skrein, Jackie Earle Haley and Keean Johnson also star in supporting roles. Not to be confused with the manga the film is based on, Battle Angel Alita. Originally announced in 2003, production on the release of the film was repeatedly delayed due to Cameron's work on Avatar and its sequels. After years of the film languishing in development hell, Rodriguez was announced as the film's director in April 2016, with Salazar being cast the following month. Principal photography began in Austin, Texas, in October 2016, lasting through February 2017. Alita: Battle Angel had its world premiere at the Odeon Leicester Square on January 31, 2019, and was released in the United States on February 14, 2019, by 20th Century Fox in Real D 3D, Dolby Cinema 3D and IMAX 3D formats. This also marks the first film to be produced by Lightstorm Entertainment in ten years since 2009's Avatar. The film has grossed over $265 million worldwide. It received mixed reviews from critics, with praise for its visual effects, action sequences and Salazar's performance while criticism was directed at the "muddled" screenplay and the set-up of sequels. In contrast, the film received a more positive response from audiences. In 2563, a catastrophic war known as "The Fall" aka "The Great War" has left Earth devastated. While scouting the junkyard metropolis of Iron City, cyborg scientist Dr. Dyson Ido discovers a disembodied female cyborg with a fully intact human brain. Ido rebuilds the cyborg, who does not have any recollections of her past, and names her "Alita" after his deceased daughter. Alita meets her eventual best friend, Hugo, who dreams of moving to the wealthy sky city of Zalem. Hugo introduces her to the competitive sport of Motorball, a battle royale race wherein cyborgs fight to the death. Alita discovers that Ido is a Hunter-Warrior (bounty hunter) when she follows him one night and they encounter three cyborg assassins led by Grewishka. When Ido is injured, Alita instinctively attacks the cyborgs, killing two of them and severely damaging Grewishka, who retreats underground. Despite Alita rediscovering her skill in the ancient martial art of "Panzer Kunst", Ido discourages her from becoming a Hunter-Warrior. The next day, Alita finds and brings home a Berserker body from an old downed ship outside the city. Ido refuses to install her in the body, fearing the consequences of her heart's full compatibility with it. Fed up with Ido, Alita registers herself as a Hunter-Warrior, then she and Hugo enter the Kansas Bar to ask other Hunter-Warriors in helping her take down Grewishka, but they refuse, as Grewishka is not on the wanted list. Suddenly, an upgraded Grewishka storms into the bar and challenges Alita to a rematch, revealing that he has been sent by his boss, Nova, to destroy her. Despite her courage and combat skills, Alita's body is sliced up by Grewishka's bladed fingers before she blinds him with her left arm, before he is forced to retreat. Ido transplants Alita in the Berserker body, which automatically interfaces with her system. Having fallen in love with Hugo, Alita enters a Motorball tryout race as a means to send Hugo to Zalem. Ido discovers that the other contestants are Hunter-Warriors and wanted cyborgs hired by Vector, an entrepreneur working under Nova, to kill her. He warns Alita, and as the race begins, she destroys many of the contestants with her superior skills. Meanwhile, Hugo is being hunted by a Hunter-Warrior named Zapan, after he frames Hugo for murdering a cyborg. Hugo calls Alita for help and she leaves the Motorball race to rescue him. She finds Hugo just as Zapan arrives and reveals to her that Hugo has been attacking cyborgs and stealing their parts for Vector for use in his Motorball games. Knowing that Alita is in love with Hugo, Zapan mortally wounds him and tells Alita that Hunter-Warrior law dictates that she must either kill Hugo or let Zapan finish him off. Dr. Chiren, Ido's ex-wife and also a master cyborg engineer, manages to save Hugo by attaching his head to Alita's heart. Zapan attempts to stop Alita from leaving and she slices part of his face off with his prized sword, crafted with the same advanced technology as the Berserker body, which she takes with her. Ido transplants Hugo's head onto a cyborg body before telling Alita that Hugo's actions were based upon the false belief that he would be able to eventually buy his way into Zalem. Ido confides that this was a lie fabricated by Vector, and that citizens of Iron City cannot enter Zalem unless they become Motorball champion. Alita decides to confront Vector, who is being mind-controlled by Nova, a powerful Zalem scientist. Through Vector, Nova reveals to Alita that Chiren has been harvested for her organs and then orders Grewishka to kill her. Alita battles Grewishka again and this time, thanks to her new equipment, finally kills him with ease, then stabs Vector, telling Nova that he made the mistake of underestimating her. Ido tells Alita that Hugo has fled and is desperately attempting to climb a factory tube towards Zalem. Alita pleads with Hugo to return with her, but a massive spiked defense ring set off by Nova shreds Hugo's body and throws him into the air. Leaping after him, Alita is unable to prevent Hugo from falling to his death, but not before he can thank her for changing him. Rosa Salazar as Alita, a revived cyborg - revealed to be a 300-year-old soldier from a Mars-based technological group on a mission to take down Nova - and is the last of her kind. Christoph Waltz as Dr. Dyson Ido, a renowned scientist, Hunter-Warrior and Alita's father-figure. Keean Johnson as Hugo, Alita's love interest, a more moral junk dealer. Mahershala Ali as Vector, an entrepreneur who rigs Motorball combat matches. Jennifer Connelly as Dr. Chiren, Ido's ex-wife, a master cyborg engineer who works for Vector. Ed Skrein as Zapan, a cyborg bounty hunter who develops a vendetta against Alita. Jackie Earle Haley as Grewishka, a huge cyborg who works for Nova as his personal assassin. Jorge Lendeborg Jr. as Tanji, a junk dealer friend of Hugo's, who is underhanded and doesn't share Hugo's ethics. Lana Condor as Koyomi, a kind friend of Hugo's. Eiza González as Nyssiana, a cyborg assassin with a bounty on her head. Idara Victor as Nurse Gerhad, Ido's aide. Jeff Fahey as McTeague, a Hunter-Warrior who leads a pack of cyborg and robotic dogs. Rick Yune as Master Clive Lee, a Hunter-Warior who claims a record of over 200 kills. Leonard Wu as Kinuba, a Motorball player. Elle LaMont as Screwhead, a female Hunter-Warrior. In uncredited roles, Edward Norton appears as Nova, the immortal Zalem scientist and leader who has the ability to transfer his consciousness into other people's bodies; Michelle Rodriguez appears as Gelda, a cyborg warrior from Mars who trained Alita; and Jai Courtney cameos as Jashugan, a Motorball Champion. Battle Angel Alita, an early 1990s Japanese cyberpunk manga series written by Yukito Kishiro, was originally brought to James Cameron's attention by filmmaker Guillermo del Toro, and Cameron immediately became enamored with the concept. The domain name "battleangelalita.com" was registered to James Cameron by 20th Century Fox around June 2000. Fox also registered the "battleangelmovie.com" domain. In April 2003, it was reported by Moviehole that Cameron had confirmed he would direct a Battle Angel film. Cameron confirmed that a script for the film was in production during an interview on the Tokudane! program on Fuji TV on May 4, 2003. It was originally scheduled to be his next production after the TV series Dark Angel, which was influenced by Battle Angel Alita. It was later scheduled to be his next film after Aliens of the Deep in January 2005. In June 2005, The Hollywood Reporter claimed that the film was being delayed while Cameron developed a film known as Project 880, which would later be renamed Avatar. Entertainment Weekly ran an interview in February 2006 in which Cameron stated that his deal with 20th Century Fox was that he produce both films. The article also claimed that Battle Angel was slated to be released in September 2009. In June 2006, Cameron commented that Battle Angel was the second of two planned film trilogies he was developing, with the first being Avatar. In May 2008, Cameron indicated he would be working on a film titled The Dive, a biography of freedivers Francisco Ferreras and Audrey Mestre, thus delaying the film again. That July, at the San Diego Comic-Con International, he reiterated that he was still committed to making the film. In December 2009, Cameron commented during an interview with MTV News that a script for Battle Angel had been completed. In February 2010, producer Jon Landau commented during an interview that he was trying to convince Cameron to change the film's title to Alita: Battle Angel. Landau also revealed that screenwriter Laeta Kalogridis had worked on writing the film. In August 2010, Cameron stated that the film was "still on [his] radar", but he didn't know when he would make it. However, that October, he confirmed that his next films would be two Avatar sequels instead of Battle Angel. He still stated that he did not intend to abandon the film, stating that he loved the project too much to hand it off to another director, but reiterated in June 2011 that it would not be produced until the two Avatar sequels were completed, stating that "Battle Angel is not going to happen for a few years". According to Cameron, his reason for producing Avatar first is because he believes that the film can raise public awareness of the need for environmental protection. During an interview with Alfonso Cuarón in July 2013, Cameron set 2017 as the date at which production on the film would begin. In October 2015, The Hollywood Reporter reported that director Robert Rodriguez was in negotiations to direct the film, now titled Alita: Battle Angel, and Cameron would be attached as producer alongside Jon Landau. Rodriguez had been brought in by Cameron to condense and combine Cameron's 186-page screenplay and some 600 pages of notes into what could be the shooting script. Satisfied by Rodriguez's work on the shooting script, Cameron offered him the directing job. In April 2016, The Hollywood Reporter reported that 20th Century Fox had not yet greenlit the film, as they were attempting to reduce the budget to something below $175–$200 million. The article also announced that Rodriguez had been signed as director. In late May 2016, Fox scheduled the film for a July 20, 2018, release date. With James Cameron as potential director, the film was to be produced with the same mix of live-action and computer-generated imagery that Cameron used in Avatar. Specifically, Cameron intended to render the main character, Alita, completely in CGI. Cameron has stated that he would make use of technologies developed for Avatar to produce the film, such as the Fusion Camera System, facial performance capture, and the Simulcam. In May 2006, Variety reported that Cameron had spent the past ten months developing technology to produce the film. In October 2008, Mark Goerner, a digital artist who had worked on the film for a year and a half, commented that pre-production work on the film was mostly finished. In a February 2019 interview, Cameron revealed that he set the floating city of Zalem in Panama, specifically Panama City. He explained that the city Zalem is not floating, but hanging from a space elevator, which would only work physically near the equator. As a result of the new location, Iron City was designed with Spanish signage and Latin American architecture. An April 2016 article in The Hollywood Reporter reported that Maika Monroe, Rosa Salazar and Zendaya were among the final actresses being considered to take the role of Alita in the film, with a decision due within a few weeks. The article reported that Zendaya's former co-star Bella Thorne had also auditioned for the role. Near the end of May 2016, Collider reported that Salazar had been chosen. In August 2016, it was reported that Christoph Waltz was in negotiations to play Dr. Dyson Ido, the equivalent of Daisuke Ido from the original manga. On September 14, 2016, it was announced that Jackie Earle Haley had been cast as a cyborg villain. On September 21, 2016, Variety reported that Ed Skrein was in talks for a role in the film; The Hollywood Reporter later confirmed that he had been cast as the antagonist Zapan. On September 30, 2016, Keean Johnson was reported to have been cast in the film to play Hugo, Alita's love interest, who later becomes the reason for her to play a gladiator-style game called Motorball. The studio also considered Avan Jogia, Douglas Booth, Jack Lowden, and Noah Silver for the role, but decided on Johnson because they were looking for someone more "ethnically ambiguous". On October 3, 2016, Mahershala Ali was reportedly in talks for the villainous role of Vector, a man who rigs Motorball combat matches. In an interview following his Best Supporting Actor win at the 89th Academy Awards, Ali revealed that he would play two roles in the film, although he did not elaborate on the nature of the second role. On October 5, 2016, it was reported that Eiza González had joined the film. González is one of the leads in Rodriguez' television series From Dusk till Dawn: The Series. Jorge Lendeborg Jr. was announced for a role in the film on October 7, 2016. He will play Hugo's friend. Lana Condor was reported to have joined the cast on October 11, 2016, portraying the orphaned teen Koyomi. On October 18, 2016, Leonard Wu was cast as the cyborg Kinuba. Marko Zaror joined the cast as the cyborg Ajakutty in December 2016. On February 7, 2017, Jennifer Connelly joined the film in an unknown villainous role. Michelle Rodriguez was retroactively announced for a role on February 22, 2017, after the film had completed shooting. The film began shooting at Robert Rodriguez' Troublemaker Studios in Austin, Texas on October 17, 2016, and concluded on February 9, 2017. In late January 2017, a casting call went out looking for rocker, punk, or emo extras to film scenes in Austin on the nights of February 3, 6, and 7, 2017. On December 17, 2018, it was announced that Dua Lipa would have a song featured on the film's soundtrack titled "Swan Song". The song and official music video were released on January 24, 2019. The official music video is directed by Floria Sigismondi. Tom Holkenborg composed the score for the film as well as "Swan Song" as co-writer. The soundtrack was released on February 15, 2019, at Milan Records. The visual effects were provided by Weta Digital, DNEG and Framestore and supervised by Joe Letteri, Eric Saindon, Nick Epstein, Raymond Chen and Nigel Denton-Howes. The first trailer for the film was released on December 8, 2017, with a July 2018 release in mind. The footage received a mixed response, with a majority of the commentary focusing on the appearance of the titular character, Alita. Andrew Liptak of The Verge stated that "The character looks like an anime doll come to life, or like a Disney character that's just a hair off from normal. It's probably a deliberate choice, meant to remind viewers at every moment that Alita isn't human. But after so many years of CGI animators trying to mimic convincing human faces and not entirely succeeding, it's still unsettling to see a character hovering this close to realistic, while staying this far away from it." Adam Chitwood of Collider was intrigued and cautiously optimistic, saying, "This thing looks bonkers, and now it's crystal clear why Cameron was considering directing this in the first place. The choice to make your protagonist a photo-real CG creation interacting with actual human characters is mighty ambitious, and I can say with certainty this doesn't look like anything Robert Rodriguez has done before. I don't know if it'll be good, but it definitely seems like it'll at least be interesting." A second trailer was shown at SDCC 2018 and made its way online on July 23, 2018, with a December 2018 release in mind. The trailer featured a cover of Linkin Park's "New Divide", covered by composer J2 featuring vocalist Avery. The third trailer was released in November 2018, almost a year after the first trailer was launched. A tie-in novel was released on November 20, 2018, written by notable sci-fi author Pat Cadigan. Entitled Iron City, the novel's story acted as a prequel focused on some of the residents living in Iron City before the events of the film. An audiobook adaptation of the novel was also released on the same date, narrated by Brian Nishii. In February 2019, Twentieth Century Fox collaborated with Iam8bit to create "Passport to Iron City", a recreation of the film's setting for fans to tour. "Passport to Iron City" is available in New York City, Los Angeles, and Austin. The film was released by 20th Century Fox in the United States on February 14, 2019, in standard, 3D and IMAX format. It was originally set to be released on July 20, 2018, but in February 2018, the film was delayed to December 21, before later being pushed back again in late September to its final release date. The film is set for release in Japan and China on February 22, 2019, after the Chinese New Year holidays. The film was released in Hong Kong, Malaysia and Taiwan on February 5, the Philippines on February 6, and India on February 8. The film held its world premiere on January 31, 2019, at the Leicester Square Theatre in London. On January 28, 2019, Cameron announced that the film would hold free one-day previews in the United States on January 31, 2019. As of February 25, 2019[update], Alita: Battle Angel has grossed $62 million in the United States and Canada, and $203.8 million in other territories, for a worldwide total of $265.8 million, against a production budget of $170 million. Estimates vary for the total worldwide gross the film needs in order to break-even, with Fox insiders claiming $350 million but outside financial publications claiming around $400–550 million. In the United States and Canada, the film was initially projected to gross $18–22 million in its opening weekend, and around $25 million from 3,790 theaters over its first four days. After making $8.7 million on its first day (including $2.4 million from Wednesday night previews), five-day projections were increased to $36–40 million. It then made $7.5 million on its second day of release and went on to debut to $28.5 million in the weekend, finishing first at the box office. It also had a four-day gross of $36.5 million and five-day total of $43 million. Opening weekend audiences consisted of 60% male and 40% female, with demographics including 44% Caucasian, 21% Hispanic, 15% Asian American and 14% African American. The film dropped 58% in its second weekend, making $12 million and finishing second behind newcomer How to Train Your Dragon: The Hidden World. Alita opened a week early in 11 international markets (including ten Asian countries as well as the United Kingdom), where it grossed $32 million in its opening weekend. It opened at number two in South Korea with $10.9 million, first in Taiwan with $4.2 million (where it was Fox's fourth biggest opening ever), $4.2 million in the United Kingdom (with a 42% being from 3D shows), and $2.9 million in Malaysia (where it was Fox's second biggest opening ever). In its second international weekend, the film grossed $56.2 million from 86 markets, bringing its international gross to $94.4 million. The film has outpaced The Maze Runner (2014) and Ready Player One (2018) in these markets by 43% and 5%, respectively. It was the weekend's second highest-grossing film with $84 million worldwide, behind the Chinese film The Wandering Earth. In China, Alita earned $1 million from early midnight previews prior to release. It had a China opening-day gross of $20 million on February 22, 2019, surpassing expectations, with its opening-weekend projection increasing from $50 million to over $60 million. The film's daily gross increased to $24.8 million on its second day, for a two-day gross of $44.55 million in China. The film had an opening weekend gross of $65 million in China, making it Fox's biggest opening of all time in the country. It also set a new February IMAX record, with $9 million (14%) from 603 IMAX screens in China. Chinese opening weekend audiences consisted of 54% male and 46% female. In Japan, the film launched with $3.2 million in its opening weekend. In its third international weekend, it topped the international box office with $92.5 million in 82 markets. The film also topped the worldwide box office with $104,419,754 that weekend. On review aggregator Rotten Tomatoes, Alita: Battle Angel holds an approval rating of 59% based on 264 reviews, with an average rating of 5.9/10. The website's critical consensus reads, "Alita: Battle Angel's story struggles to keep up with its special effects, but fans of futuristic sci-fi action may still find themselves more than sufficiently entertained." On Metacritic, the film has a weighted average score of 54 out of 100, based on 48 critics, indicating "mixed or average reviews". Audiences polled by CinemaScore gave the film an average grade of "A–" on an A+ to F scale, while those at PostTrak gave it an overall positive score of 78% and a 59% "definite recommend". 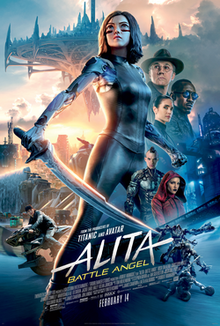 Michael Nordine of IndieWire gave the film a grade of "B+", saying, "Alita: Battle Angel is [Rodriguez's] best film since he brought Frank Miller's graphic novel to the screen, a sci-fi epic that does something rare in an age of endless adaptations and reboots: lives up to its potential while leaving you wanting more." Writing for Variety, Guy Lodge praised Rodriguez's effort but called the film "muddled" and wrote: "This manga-based cyberpunk origin story is a pretty zappy effects showcase, weighed down by a protracted, soul-challenged Frankenstory that short-circuits every time it gets moving." Monica Castillo from RogerEbert.com wrote that the "visual bonanza cooked up by Rodriguez, cinematographer Bill Pope and editors Stephen E. Rivkin and Ian Silverstein is enough to power through any narrative bumps with quickly paced action and bleak, yet colorful, imagery" and gave film 2.5 out of 4. On January 30, 2019, Epic Stone Group, a Florida-based multimedia company, sued Twentieth Century Fox for trademark infringement over the "Battle Angel" name. The lawsuit claims that Epic Stone Group had filed the trademark for "Battle Angel" in 2009 for computer games, action figures, and other merchandise, and it had filed a new application in April 2018 to use the name on DVDs, e-books, films, and television programs. Cameron and Rodriguez have hinted that the film could lead to multiple sequels. On February 6, 2019, they announced that they have plans for Alita: Battle Angel 2 in the future. The casting of Edward Norton in a non-speaking role as Nova in this film was intended to be a setup for the sequel. ↑ "Camera Operator Winter 2017". 1 2 3 "Film releases". Variety Insight. Retrieved April 30, 2017. 1 2 Jeremy Fuster (January 31, 2019). "'Alita: Battle Angel' on Track to Become Fox's Final Release – and a $200 Million Flop". TheWrap. Retrieved February 5, 2019. ↑ "Alita: Battle Angel Home Page". FoxMovies. Retrieved January 13, 2019. 1 2 3 4 5 D'Alessandro, Anthony (February 17, 2019). "'Alita' Battles Her Way To $41M+ 5-Day, But Remains Far From Heaven At The B.O." Deadline Hollywood. Retrieved February 17, 2019. 1 2 3 "Alita: Battle Angel (2019)". Box Office Mojo. IMDb. Retrieved February 26, 2019. ↑ McKenna Gray (February 7, 2019). "Alita: Battle Angel succeeds where other cyberpunk films have failed". TheASide.com. Retrieved February 19, 2019. ↑ Christopher Campbell (February 1, 2019). "Alita: Battle Angel Early Reviews: Mind-Blowing Effects Meet A Mind-Numbing Script". Rotten Tomatoes. Retrieved February 2, 2019. 1 2 Mueller, Matthew (October 3, 2016). "'Luke Cage' Villain Mahershala Ali in Talks to Join James Cameron's 'Alita: Battle Angel' (Exclusive)". The Hollywood Reporter. ↑ O'Hara, Helen. "Alita: Battle Angel Trailer Breakdown". Empire. ↑ Keys, Rob (November 13, 2018). "James Cameron's Avatar Was Originally Written to be Rated R". Screen Rant. ↑ Ben Travis, Nick De Semlyen (November 27, 2018). "Alita: Battle Angel – Meet Cyborgs Zapan and Grewishka In Exclusive Images". Empire. ↑ DrGrantAICN. "Dr. Grant discusses STARSHIP TROOPERS, ALITA: BATTLE ANGEL, and more with Casper Van Dien!!". 1 2 Armitage, Hugh (February 6, 2019). "Alita: Battle Angel plans for the sequel in the Future". Digital Spy. Retrieved February 6, 2019. ↑ Giroux, Jack (February 22, 2017). "Michelle Rodriguez Joins Robert Rodriguez's 'Alita: Battle Angel'". Slashfilm. 1 2 3 Carroll, Larry (February 18, 2010). "'Avatar' Producer Says 'Battle Angel Alita' Has A New Name, Will Follow 'Avatar 2'". MTV News. Retrieved May 3, 2016. 1 2 Daniels, Hunter (January 31, 2011). "BATTLE ANGEL Update from James Cameron". Collider. Retrieved May 3, 2016. ↑ Carroll, Larry (March 1, 2010). "James Cameron Wants 3-D 'Battle Angel Alita' Motorball Scenes, Will Focus On Early Chapters Of Series". MTV News. Retrieved May 3, 2016. ↑ "Cameron Still Aims to Direct Battle Angel After Avatar 2/3". Anime News Network. February 1, 2011. Retrieved May 3, 2016. ↑ Barder, Ollie. "The Latest 'Alita: Battle Angel' Trailer Finally Shows Off The Brutal Sport Of Motorball". Forbes. Retrieved 2018-12-04. ↑ "James Caeron interested in Alita". Anime News Network. June 27, 2000. Retrieved April 28, 2016. ↑ "Battle Angel Alita Domains". Anime News Network. January 8, 2001. Retrieved April 28, 2016. ↑ "Cameron's Alita confirmed?". Anime News Network. April 17, 2003. Retrieved April 28, 2016. ↑ "Cameron's Alita in pre-production". Anime News Network. May 7, 2003. Retrieved May 3, 2016. 1 2 "Cameron Talks About Battle Angel". Anime News Network. November 22, 2004. Retrieved May 3, 2016. ↑ "James Cameron to Delay Battle Angel?". Anime News Network. June 16, 2005. Retrieved May 3, 2016. 1 2 "James Cameron: Battle Angel Alita 'Still On My Radar'". Anime News Network. August 20, 2010. Retrieved May 3, 2016. 1 2 "News on Cameron's Battle Angel". Anime News Network. February 19, 2006. Retrieved May 3, 2016. ↑ Carroll, Larry (June 29, 2006). "'Titanic' Mastermind James Cameron's King-Size Comeback: Two Sci-Fi Trilogies". MTV News. Retrieved May 3, 2016. ↑ "Cameron Not Planning on Battle Angel after Avatar Film". Anime News Network. May 16, 2008. Retrieved May 3, 2016. ↑ "Cameron: Still Looking at Battle Angel 'Very Seriously' (Updated)". Anime News Network. July 25, 2009. Retrieved May 3, 2016. 1 2 Marshall, Rick (December 14, 2009). "'Avatar' Director Offers Update On 'Battle Angel Alita' Adaptation". MTV News. Retrieved May 3, 2016. ↑ "Cameron's Next Films to Be Avatar 2/3, Not Battle Angel". Anime News Network. October 27, 2010. Retrieved May 3, 2016. ↑ "Cameron: Battle Angel Still Planned After Avatar 2/3". Anime News Network. June 10, 2011. Retrieved May 3, 2016. ↑ "EXCLUSIVE: James Cameron is still going to do BATTLE ANGEL ALITA, but not for a while!!!". Ain't It Cool News. May 8, 2012. Retrieved May 3, 2016. ↑ Schwartz, Terri (April 17, 2012). "James Cameron: 'Avatar' Will Do 'More Good' Than 'Battle Angel'". MTV News. Retrieved May 3, 2016. ↑ "Cameron: Will Start Developing Battle Angel Alita in 2017". Anime News Network. July 9, 2013. Retrieved May 3, 2016. ↑ Kit, Borys (October 14, 2015). "James Cameron, Robert Rodriguez Teaming Up for 'Battle Angel Alita' Movie". The Hollywood Reporter. Retrieved May 3, 2016. 1 2 Nobil, Taryn (December 8, 2017). "James Cameron and Robert Rodriguez's Alita: Battle Angel Gets Creepy First Trailer". Variety. Retrieved December 9, 2017. 1 2 3 4 Kit, Borys (April 26, 2016). "Zendaya Among Finalists for James Cameron's 'Battle Angel' Movie (Exclusive)". The Hollywood Reporter. Retrieved May 3, 2016. 1 2 Chitwood, Adam (May 28, 2016). "Fox Dates 'Alita: Battle Angel'; Shifts 'The Predator' and Two Marvel Movies". Collider. Retrieved May 28, 2016. ↑ "James Cameron Lists Needed Tech for Battle Angel Film". Anime News Network. August 5, 2009. Retrieved May 3, 2016. ↑ Hendrix, Grady (May 28, 2006). "Manga's the rights fit for majors". Variety. Retrieved May 3, 2016. ↑ "CG Artist Interviewed on Prelim. Battle Angel Designs". Anime News Network. October 25, 2008. Retrieved May 3, 2016. 1 2 "James Cameron's sci-fi cyborg dystopia grapples with female coming of age". EFE. February 4, 2019. Retrieved February 9, 2019. ↑ Zakarin, Jordan (February 15, 2019). "Why Alita: Battle Angel was set in Latin America and used so many 3D printers". Syfy.com. Retrieved February 20, 2019. ↑ Gig Patta (February 14, 2019). "Alita: Battle Angel: Director Robert Rodriguez Bringing James Cameron's Vision to Life [Exclusive Interview]". lrmonline.com. Retrieved February 20, 2019. ↑ Foutch, Haleigh (May 26, 2016). "Exclusive: Rosa Salazar to Lead 'Battle Angel Alita'". Collider. Retrieved May 26, 2016. ↑ Kit, Borys (August 24, 2016). "Christoph Waltz in Talks to Star in James Cameron's 'Alita: Battle Angel' (Exclusive)". The Hollywood Reporter. Retrieved August 24, 2016. ↑ "Christoph Waltz in Talks to Star in James Cameron's Alita: Battle Angel". Anime News Network. August 24, 2016. Retrieved August 24, 2016. 1 2 Kit, Borys (September 14, 2016). "James Cameron's 'Alita: Battle Angel' Casts Jackie Earle Haley (Exclusive)". The Hollywood Reporter. Retrieved September 14, 2016. ↑ McNary, Dave (September 21, 2016). "Ed Skrein in Talks to Join James Cameron's 'Alita: Battle Angel'". Variety. Retrieved September 21, 2016. ↑ Kit, Borys (September 21, 2016). "'Deadpool' Bad Guy Ed Skrein Joins James Cameron's 'Alita: Battle Angel' (Exclusive)". The Hollywood Reporter. Retrieved September 22, 2016. 1 2 Kit, Borys (September 30, 2016). "'Nashville' Actor Nabs Key Role in 'Alita: Battle Angel' (Exclusive)". The Hollywood Reporter. Retrieved October 1, 2016. ↑ Fischer, Russ (February 27, 2017). "Oscar-Winner Mahershala Ali Plays Two Roles In 'Alita: Battle Angel'". Moviepilot. Archived from the original on February 27, 2017. Retrieved February 27, 2017. ↑ McNary, Dave (October 5, 2016). "James Cameron's 'Alita: Battle Angel' Adds Eiza Gonzalez". Variety. Retrieved October 6, 2016. ↑ Galuppo, Mia (October 7, 2016). "'Alita: Battle Angel' Adds 'Spider-Man: Homecoming' Actor (Exclusive)". The Hollywood Reporter. Retrieved October 11, 2016. ↑ N'Duka, Amanda (October 11, 2016). "'X-Men' Actress Lana Condor Joins 'Alita: Battle Angel'; 'Pacific Rim' Sequel Adds Ivanna Sakhno". Deadline Hollywood. ↑ McNary, Dave (October 19, 2016). "Leonard Wu Joins James Cameron's 'Alita: Battle Angel' (EXCLUSIVE)". Variety. Retrieved October 22, 2016. ↑ Martin, Peter (December 2016). "Marko Zaror Joins ALITA: BATTLE ANGEL". Screen Anarchy. Retrieved December 6, 2016. ↑ Kit, Borys; Porreca, Brian (February 7, 2017). "Jennifer Connelly Joins James Cameron's 'Alita: Battle Angel' (Exclusive)". The Hollywood Reporter. Retrieved February 8, 2017. ↑ Hibberd, James (February 22, 2017). "Michelle Rodriguez joins 'Alita: Battle Angel' movie". Entertainment Weekly. Retrieved February 23, 2017. ↑ "Job Hotline - Crew & Industry Calls - Alita: Battle Angel". Texas Film Commission. Archived from the original on October 12, 2016. Retrieved October 11, 2016. ↑ "Austin filming locations for Alita: Battle Angel". kftv.com. February 6, 2019. Retrieved February 19, 2019. ↑ Cunningham, Chelsea (January 31, 2017). "Rocker, emo-types wanted for Sci-Fi movie filming in Austin". KVUE. Retrieved February 8, 2017. ↑ Jechow, Andy (January 31, 2017). "Robert Rodriguez film seeking 'edgy' extras in Austin". KXAN-TV. Retrieved February 8, 2017. ↑ "'Alita: Battle Angel' to Feature New Song by Dua Lipa". Variety. December 18, 2018. Retrieved December 19, 2018. ↑ "Swan Song (From the Motion Picture "Alita: Battle Angel") - Single by Dua Lipa on iTunes". iTunes. January 24, 2019. Retrieved January 26, 2019. ↑ "Alita Battle Angel (Original Motion Picture Soundtrack) - Album by Tom Holkenborg on iTunes". iTunes. February 15, 2019. Retrieved February 2, 2019. ↑ "ALITA: BATTLE ANGEL - The Art of VFX". www.artofvfx.com. Retrieved January 5, 2019. ↑ Liptak, Andrew (December 8, 2017). "The first trailer for Robert Rodriguez's Alita: Battle Angel falls squarely into the uncanny valley". The Verge. Retrieved December 9, 2017. ↑ Chitwood, Adam (December 8, 2017). "First 'Alita: Battle Angel' Trailer Reveals Robert Rodriguez's Crazy Sci-Fi Adaptation". Collider. Retrieved December 9, 2017. ↑ McNary, Dave (July 23, 2018). "'Alita: Battle Angel': Cyborgs Face Off in Latest Eye-Popping Trailer". variety. Retrieved July 23, 2018. ↑ Eddy, Cheryl (November 16, 2018). "Alita: Battle Angel's New Trailer Digs Into the Heart of the Most Advanced Weapon Ever". Gizmodo UK. Retrieved 2018-12-04. ↑ Bertschy, Zac (February 5, 2019). "Passport to Iron City with Battle Angel Alita Mangaka Yukito Kishiro". Anime News Network. Retrieved February 5, 2019. ↑ Couch, Aaron (September 28, 2018). "'Dark Phoenix' Pushed Back to June 2019, Untitled 'Deadpool' Opening In December". The Hollywood Reporter. Retrieved September 28, 2018. ↑ Chitwood, Adam (September 27, 2016). "'The Predator', 'Maze Runner', Mystery Marvel Movie and More to Get IMAX Release". Collider. Retrieved September 27, 2016. ↑ Valdez, Nick (October 16, 2018). "'Alita: Battle Angel' Reveals First Japanese Poster". ComicBook.com. Gamespot/CBS Interactive. Retrieved February 8, 2019. ↑ "'Alita: Battle Angel' Secures Theatrical Release in China". Variety. January 11, 2019. ↑ "Alita: Battle Angel". Cinema.com.my. Retrieved February 8, 2019. ↑ Gil, Baby A. (January 11, 2019). "Dua Lipa gets into the movies with Alita". The Philippine Star. Retrieved February 8, 2019. ↑ "'Alita: Battle Angel' to release in India before US". The Times of India. January 7, 2019. Retrieved February 8, 2019. ↑ Lewis Knight (January 31, 2019). "Alita: Battle Angel world premiere sees Rosa Salazar, Dua Lipa hit red carpet". Daily Mirror. Retrieved February 1, 2019. ↑ "Free, early 'Alita: Battle Angel' screenings announced by James Cameron". EW.com. Retrieved 2019-01-28. ↑ "Box Office: 'Alita: Battle Angel' Scores Needed Win With $62M China Debut". The Hollywood Reporter. February 24, 2019. Retrieved February 24, 2019. ↑ "Box Office: 'Alita: Battle Angel' Wins Valentine's Day With $8.7M". The Hollywood Reporter. February 14, 2019. Retrieved February 15, 2019. ↑ D'Alessandro, Anthony (February 15, 2019). "'Alita: Battle Angel' Gets The Most Love At Valentine's Day B.O. With $8.7M & 'A-' CinemaScore – Update". Deadline Hollywood. Retrieved February 15, 2019. ↑ "Why Alita: Battle Angel DIDN'T Bomb At The Box Office". Screen Rant. February 19, 2019. Retrieved February 19, 2019. ↑ Mendelson, Scott (February 18, 2019). "Can 'Alita: Battle Angel' Defy Skeptics And Become A Hit?". Forbes. Retrieved February 24, 2019. ↑ Tartaglione, Nancy (February 10, 2019). "'Alita: Battle Angel' Off To $32M Start; 'Aquaman' Dives Into Japan Where 'Bo Rhap' Crosses $100M – International Box Office". Deadline Hollywood. Retrieved February 10, 2019. ↑ Tartaglione, Nancy (February 17, 2019). "'Alita' Adds $56M Overseas; 'The Wandering Earth' Becomes #2 Movie Ever In China – International Box Office". Deadline. Retrieved February 17, 2019. ↑ "Comscore Announces Official Worldwide Box Office Results for Weekend of February 17, 2019". Comscore. February 17, 2019. Retrieved February 17, 2019. ↑ Mendelson, Scott (21 February 2019). "'Aquaman' Is About To Face Its Two Final Box Office Challenges". Forbes. Retrieved 21 February 2019. ↑ Tartaglione, Nancy (February 22, 2019). "'Alita: Battle Angel' Wings To $20M China Friday; Eyes $60M+ Middle Kingdom Bow". Deadline. Retrieved February 22, 2019. ↑ Mendelson, Scott (February 23, 2019). "Box Office: 'Alita' Stumbles In America But Soars In China". Forbes. Retrieved February 23, 2019. ↑ Tartaglione, Nancy (February 24, 2019). "'Alita: Battle Angel' Flies To $65M China Debut, Sets Fox & IMAX Records – International Box Office". Deadline. Retrieved February 24, 2019. ↑ "'Alita: Battle Angel' Finds Success in China With $62 Million Opening". The Wrap. February 24, 2019. Retrieved February 24, 2019. ↑ "阿丽塔：战斗天使" [Alita: Battle Angel]. Maoyan. Retrieved 24 February 2019. ↑ Rubin, Rebecca (February 24, 2019). "Box Office: 'Alita: Battle Angel' Rules Overseas With $62 Million Launch in China". Variety. Retrieved February 24, 2019. ↑ "Comscore Announces Official Worldwide Box Office Results for Weekend of February 24, 2019". Comscore. February 24, 2019. Retrieved February 24, 2019. ↑ "Alita: Battle Angel (2019)". Rotten Tomatoes. Fandango. Retrieved February 23, 2019. ↑ "Alita Battle Angel reviews". Metacritic. CBS Interactive. Retrieved February 23, 2019. ↑ Michael Nordine (January 31, 2019). "'Alita: Battle Angel' Review: Robert Rodriguez's Sci-Fi Epic Is His Best Film Since 'Sin City'". IndieWire. Retrieved February 1, 2019. ↑ Guy Lodge (January 31, 2019). "Film Review: 'Alita: Battle Angel'". Variety. Retrieved February 1, 2019. ↑ Monica Castilloe (February 14, 2019). "Film Review: 'Alita: Battle Angel'". RogerEbert.com. Retrieved February 14, 2019. ↑ Cullins, Ashley (January 30, 2019). "Fox's 'Alita: Battle Angel' Hit With Trademark Lawsuit". The Hollywood Reporter. Retrieved February 4, 2019. ↑ "Battle Angel - Trademark Details". Justia. Retrieved February 4, 2019. ↑ Cotter, Padraig (April 28, 2018). "Battle Angel 2 Details". Screenrant. Retrieved February 8, 2019.